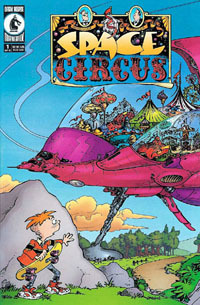 I have finally finished reading Space Circus, written by Mark Evanier and drawn by Sergio Aragonés. I’ve been writing this post for almost as long as I’ve been reading it. (Like a week or so.) Unfortunately, the comic was just okay. The art was (mostly) fantastic, and there were fun little things to look at in the background of the panels on almost every page. (My biggest qualm with the art, and this is pretty nitpicking, was that Aragonés, like most artists, has no idea how to draw people juggling. Generally the objects either just get scattered in the air above someone’s head, or they get drawn in a giant circle or arc from one hand to the other. I’m a juggler, so this bothers me.) Anyway the story was pretty mundane, in spite of its rich and enjoyable premise: basically about a boy who accidentally stumbles onto the Space Circus space ship while they’re making repairs on earth after having been set upon by space pirates, and the hilarity that ensues. Except, unfortunately, there is less hilarity than expected, or desired.